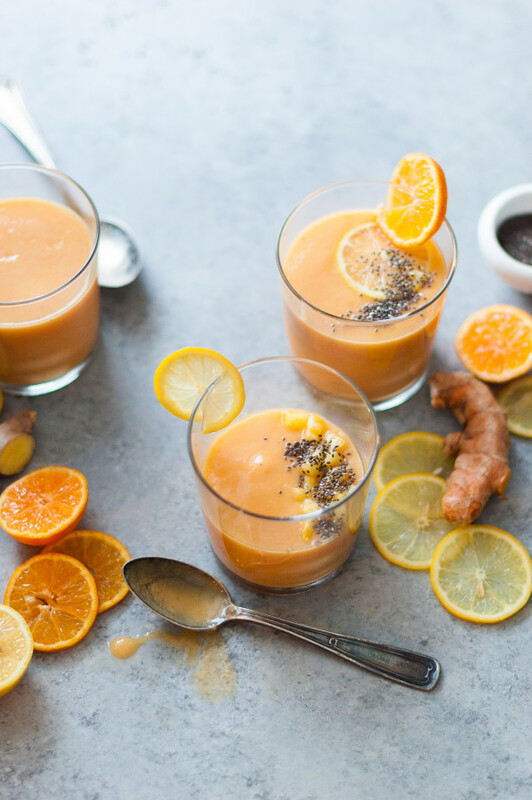 *This bright and cheerful super-charged anti-inflammatory sunshine smoothie packs a punch of anti-inflammatory ingredients! is one of those products. Just in case any of you were trying to decide what kind of blender to buy ;). I sat on the fence for awhile and buying this blender was one of the best decisions I’ve made (in the kitchen, at least…marrying my husband is best decision numero uno). It really is my most loved and functional appliance. We make a LOT of smoothies in our Vitamix, from decadent chocolate smoothies to refreshing, vitamin-packed green smoothies. I prefer our smoothies to have a lot of nutritional value and keep out the unnecessary ingredients, like sweeteners. The only smoothies we sweeten are our chocolate peanut butter smoothies, and even then it’s just a smidgen of maple syrup. in it’s place, if you can’t find the root. 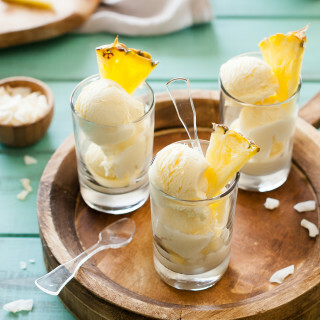 1/4 to 1/2 teaspoon should suffice for this recipe, depending on your preferences when it comes to the strength of it’s flavor – it’s quite strong! 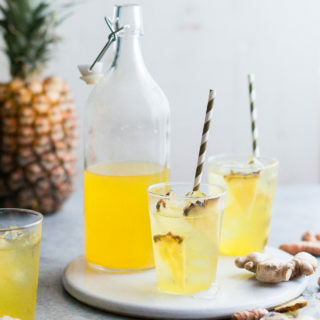 Pineapple – Fresh Pineapple contains an enzyme called ‘Bromelain’ that is an anti-inflammatory as well as containing beta-carotene, antioxidants, fiber, potassium, and minerals. 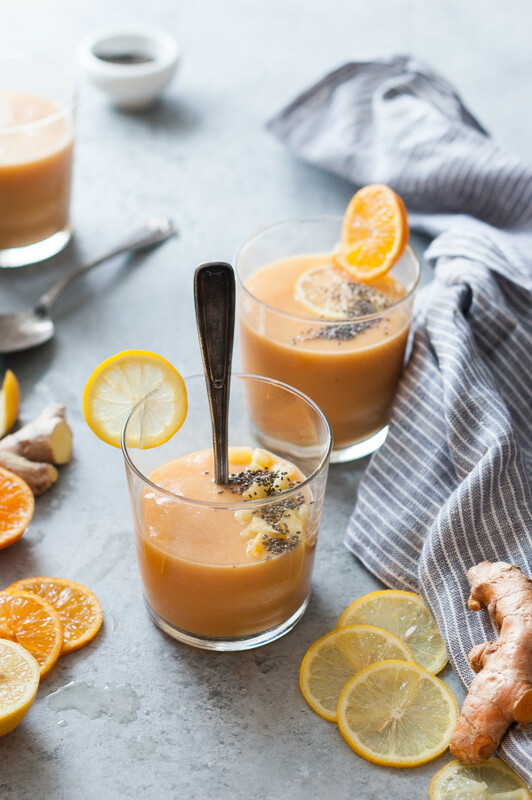 Ginger Root – Also a powerful anti-inflammatory, fresh ginger root is easy to find in almost any grocery store. 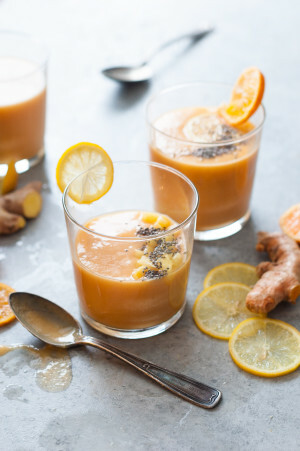 Ginger is also great for soothing upset stomachs. 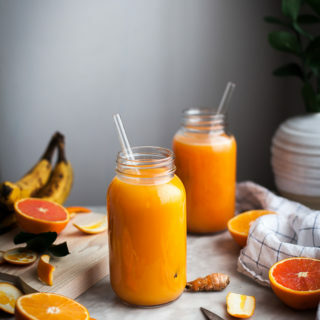 This smoothie is the perfect pick-me-up with it’s light orange color and bright flavors! Place all ingredients in a high speed blender and blend until smooth. Add more milk to get a runnier consistency. Top with chia seeds and finely diced fresh pineapple!